We recently shared our thoughts on the Henry Golden Boy .22, and spoiler: we completely loved it. So, the news that Henry, the gun manufacturer famous for their classic lever-actions, is now going to be selling through Brownells Home, one of our favorite retailers, has us pretty excited. Henry has a huge catalog, though, so with so many options to choose from, how do you know which of these beautiful and high quality rifles to choose from? Fortunately, we have the whole rundown of Henry’s complete current line. The Original Henry Rifle ($1,920) is Henry’s call back to their classic 1860 frontier era rifle. The standard model is available in .44-40 and .45 Colt specifications. Both calibers feature a 24.5″ octagonal barrel with a 13 round capacity. The Original Henry Rifle weighs in at 9 pounds and has a total length of 43”. Henry’s Classic .22 ($300) is one of the most popular lever action .22s currently on the market. The Classic Lever Action features a grooved receiver for mounting a scope, adjustable rear sight, and a hooded front sight. The standard rifle weighs 5¼ pounds and is 36¼” long. It has an 18¼” blue steel barrel with multiple groove rifling for high accuracy. The magazine can hold 15 rounds of .22 Long Rifle, 17 rounds of .22 Long and up to 21 rounds of .22 Short. In addition to the standard model, the Lever Action .22 is available in carbine and magnum versions. Henry Lever Action Carbine .22 ($300) has a length of 34″ and a 16 1/8″ barrel. In addition, it features a large loop lever to make the carbine more easily handled by large or gloved hands. A more powerful option, the Lever Action .22 Magnum ($410) has a 19¼” barrel and a magazine that holds 11 rounds. It weighs in at 5½ pounds and has an overall length of 37½”. Henry also offers a Mare’s leg edition ($350) of the Lever action .22. The Mare’s leg edition features a 12 ⅞” barrel and overall length of 25”. It weighs 4.45 lbs. The Lever Action Octagon Rifle is another frontier style lever action option from Henry. What makes this lever action stand out is its classic 20” octagonal barrel, styled like the ones favored by those who blazed the Western Trail. The Lever Action Octagon Rifle is available in three calibers, the .22 LR ($370), the .22 Magnum ($450), and the 17 HMR ($450). Henry’s Small Game Rifle retains the classic style of the Frontier Rifle but pairs it with with modern a Skinner sight. The result is a highly accurate rifle ideal for small game hunting. The Skinner sight features a solid steel rear base and fully adjustable aperture dimensioned to line up with the tall brass bead front sight. The Small Game Rifle is available in both standard and carbine versions, each of which are also available in both .22 LR and .22 magnum calibers. Both the Small Game Rifle ($400 for .22 LR, $480 for .22 magnum) and the Small Game Carbine ($410 for .22 LR, $480 for .22 magnum) feature large loop levers. The Varmint Express .17 HMR Rifle ($450) is a more compact option for small game hunters. The Varmint Express features a 20” barrel, fiber optic Williams fire sights, and a checkered American walnut Monte Carlo stock. 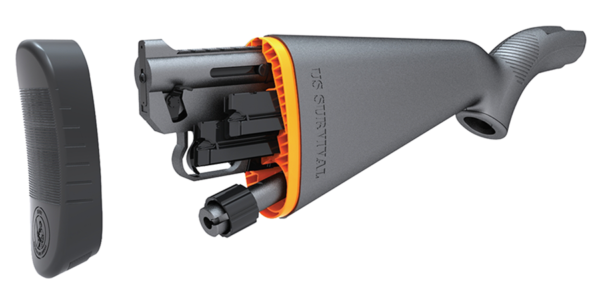 The tubular magazine fits eleven .17 HMR cartridges. The Golden Boy is Henry’s premium line of small game rifles. Enthusiasts can choose a Golden Boy chambered for .22 LR ($450), .22 magnum ($490), or .17 HMR ($500). The Golden Boy Rifle boasts an American walnut stock, brass buttplate and Brasslite receiver. The rifle features a 20” octagonal barrel. The .22 magnum ($490) and .17 HMR ($500) options are also available for purchase with large loop levers. For firearms lovers who want a little extra something, Henry offers a variety of special edition Golden Boys that stand out from the crowd. In addition, Henry offers a Deluxe Engraved 3rd Edition version of each caliber option, .22 LR ($1,220), .22 magnum ($1,250), and .17 HMR ($1,270). 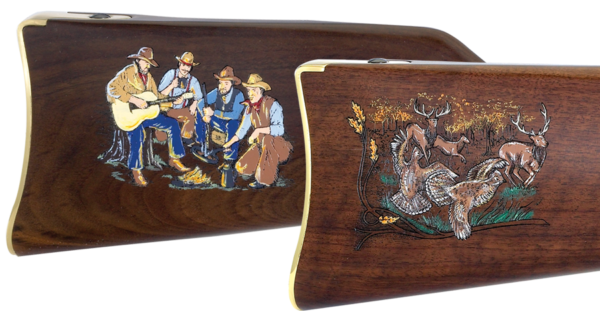 These special edition rifles have all of the perks of the original Golden Boy rifles, but with beautiful hand engraving. The Henry Silver Eagle is based on the engraved scroll and silver plated Henry Rifle that the New Haven Arms Company presented to US Secretary of the Navy under Abraham Lincoln, Gideon Welles. Secretary Wells was a national political leader and was instrumental in the creation of the Navy’s Medal of Honor. The Silver Eagle is available chambered for .22 LR ($650), .22 magnum ($700), or .17 HMR ($670). For the Silver Eagle 2nd Edition ($650) and Golden Eagle ($710), Henry took a step away from Silver Eagle’s historic roots with updated engraving. The new engraving features a soaring bald eagle surrounded by nineteenth century style scrollwork. The Golden Eagle uses 24K gold to really allow the eagle to stand out. The Silver Eagle 2nd Edition and Golden Eagle are only available calibered for .22 LR. Henry designed the American Beauty ($750) to honor the American woman. The goal was to make a rifle that, like the spirit of American women, was beautiful on both the inside and out. The main panel depicts an American Beauty rose, the namesake for the rifle, above a banner reading “American Beauty.” The rose features 14K rose gold to give it the appearance of being in bloom. The rose and banner are surrounded with floral scroll engraving. I don’t know about other American women, but I certainly appreciate a gorgeous gun designed to appeal to women without a bit of pink in sight. Finally, if you want to stand out in a subtler way, you can try the Golden Boy Silver. The Golden Boy silver is available chambered for .22 LR ($500), .22 magnum ($530), and .17 HMR ($550). The Big Boy is the Golden Boy’s heftier counterpart. The original style Big Boy can be chambered for .44 Magnum, .45 Colt, and .357 Magnum ($750), with .41 Magnum and .327 Federal Magnum options available soon. Carbines (16” barrels) chambered for .44 Magnum , .45 Colt, and .357 Magnum ($750) are also available. All caliber versions of the Big Boy are SASS approved, making it an excellent option for Cowboy Action shooting. The Big Boy features a 20” octagonal barrel, as well as a fully adjustable semi-buckhorn rear sight with a reversible white diamond insert and a brass beaded front sight. A brass barrel band and receiver couple with the American walnut stock to give the Big Boy Henry’s signature classic appearance. However, if you’re looking for an alternative aesthetic, Henry also offers several special lines of Big Boys with distinctive appearances. The Big Boy Deluxe Engraved 3rd Edition rifles take the already beautiful Big Boy rifles a step higher with gorgeous hand engraving. These rifles are available in .44 Magnum, .45 Colt, and .357 Magnum versions. Big Boy Steel rifles are available chambered for .44 Magnum, .45 Colt , .357 Magnum , and .41 Magnum ($700). Carbines are available chambered for .44 Magnum, .45 Colt, and .357 Magnum ($700). Big Boy Silver rifles are available chambered for .44 Magnum, .45 Colt, and .357 Magnum ($820). Big Boy Silver rifles are also available with deluxe hand engraving, chambered for .44 Magnum, .45 Colt, and .357 Magnum ($1,570). Finally, Henry has released two commemorative special edition versions of the Big Boy. The Cowboy ($1,090) celebrates the hard-working cowpunchers and wranglers who risked their lives in the American West. The Wildlife ($1,080) recognizes America’s rich hunting heritage, as well as the birds and beasts that make that heritage possible. Each features a beautifully engraved and hand painted walnut stock and forearm. Both are worthy of display in any home. The Big Boy is also available as a mare’s leg, with versions chambered for .44 Magnum, .45 Colt, and .357 Magnum ($800). The Long Ranger is Henry’s first venture into the long range hunting rifle game. Henry produces this rifle in .223 Remington, .243 Winchester, and .308 Winchester ($850). Henry retains their timeless lever action, but keeps it modern with a geared action that drives a machined and chromed bolt with six-lug rotary head for improved reliability. The Long Ranger also features a 20” free floating barrel for excellent precision. The detachable box magazine a steel floorplate and a blackened steel release button on the right side of the receiver. In addition to their more traditional lever action options, Henry also offers a couple larger caliber options. The .45-70 Lever Action is available with a steel finish and 18.43” round barrel ($700) as well as with a brass finish and 22” octagon barrel ($770). It has a four round capacity. The .30-30 Lever Action is also available in both a steel finish with a round barrel ($700) and a brass finish with an octagon barrel ($770). Both barrel styles are 20” and both guns have a five round capacity. The .45-70 and the .30-30 are both ideal for large game hunting. Both boast a brass bead front sight and a fully adjustable semi-buckhorn rear sight with diamond insert. Both are drilled and tapped to make adding a scope easy. Like with the Big Boy and Golden Boy, Henry makes a few alternative versions of their large caliber lever action rifles. These rifles may look great, but the changes Henry made when creating the All-Weather versions of the Lever Action .30-30 and Lever Action .45-70 ($830) are all about practicality. The metal bits of the All-Weather Lever Actions are made of steel plated with hard chrome, resistant to flaking, chipping, peeling, and corrosion. On top of that, Henry uses a treatment to increase surface hardness, reduce friction, and resist scuffing and scratching. Instead of Henry’s traditional American walnut, the wood on these rifles is stained hardwood topped with a coating that helps the rifle resist wear, scratches, moisture, and changes in temperature. Both calibers of the All-Weather Lever Action have round barrels. The Color Case Hardened Editions of the Lever Action .30-30 and Lever Action .45-70 ($830) allow owners to have the same accurate and reliable rifle, but with a more subtle and nostalgic finish than the standard brass or steel versions. The Color Case Hardened rifles have octagonal barrels. These Wildlife Editions pay tribute to the large game that made survival possible for those who blazed West. The brass Wildlife Editions provide a clean, classic look. The .30-30 Wildlife Edition ($1,050) depicts a buck’s head on the right side and a leaping buck on the left. Both are surrounded by American vine scrollwork. The .45-70 Wildlife Edition features a moose head on the right and a bear on the left. Again, both are surrounded by American vine scrollwork. For more drama, the steel framed Wildlife Editions use 24K gold to put their animal subjects in high relief. Like the brass version, the steel frame is available in both .30-30 ($1,190) and .45-70 ($1,180) calibers. Each features the same engraving as its brass counterpart. The Pump Action Octagon Rifle combines the American classic pump action with the Henry classic octagon barrel. It features a grooved receiver for mounting a scope and semi-buckhorn fully adjustable rear sights with standard 3/8″ dovetail slots, allowing users to switch out sights if they wish. The Pump Action Octagon Rifle is available in .22 LR ($450) and .22 Magnum ($480). The Henry AR-7 is an ideal rifle for backcountry sportsmen and women, whether bush pilots, backpackers, or boaters. The Henry AR-7 is chambered in .22 LR, weighs just 3.5 lbs, and has a full length of 35”. It also shrinks down to just 16.5” in length when all components are stowed in the impact and water resistant stock. This makes the rifle virtually unparalleled as a compact and durable option. The Henry AR-& is available in matte black ($230) and camouflage ($290). As you’ve probably figured out by now, Henry loves tribute editions of their rifles. As the sister of two Eagle Scouts and a former member of the Boy Scouts myself, through the coed Venturing program, these particular tributes have a place close to my heart. All of these rifles are based on a preexisting Henry rifle, so I’m not going to go into detail about the particular specs of each one. What unifies them, however, is that they support the same great program, and would all make a great gift for a Boy Scout or Eagle Scout in your life. I’m going to wrap up my overview of Henry rifles with one last group of tribute rifles. This time, Henry is honoring the various workers without which the America we know today would not be possible. All of these rifles are based on the Golden Boy and, like the Boy Scout tributes above, they all make great gifts. Also available in a Big Boy version ($1,220). Now that we’ve covered all of your Henry rifle options, which are now more conveniently available thanks to Brownells, what do you think? Are there any Henry rifles that you’re particularly excited about? Did this list help you discover any new rifles? Any favorites already in your collection? Let me know in the comments! Thinking of getting the Big Boy steel version in 357 magnum. Very beautiful in blue and wood. Bought one about 8 months ago and love it! It replaced my old Marlin lever in 44 Mag which I gave to one of my sons.